Hunt Baldwin grew up in the suburbs of Chicago. He attended Yale university, graduating in 1991, then returned to Chicago where he applied his hard won bachelor’s degree to his work playing guitar in a band called Famous Albanians. This led, as it so often does, to a suggestion from his parents that he get a job. The job he got was in advertising. Hunt spent the next decade working for various advertising agencies in Chicago, writing TV commercials for Sears, Kraft, Reebok, Minute Maid, Motorola and many others. During that time Hunt’s parents retired and moved to Wyoming. Inspired by his parents bold move to pursue a life they loved,, Hunt decided to quit his job and move west to Los Angeles to write full-time. 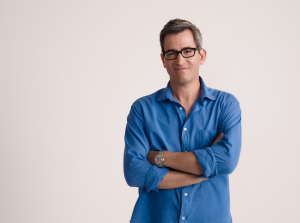 After a few bumpy years of sporadic work, Hunt and his writing partner John Coveny were hired to write on the first season of TNT’s new show The Closer. Here that they not only found writing success, penning 13 episodes and eventually rising to the level of Co-Executive Producers, but they also met Greer Shephard. Together, they continue to develop shows, including the 2008 TNT show Trust Me and the current Netflix original series Longmire, set in his family’s adopted state of Wyoming.